Atascadero Lake was bluer than usual on April 18—too blue, actually. If its brightness looked unnatural to lake enjoyers that day, it’s because it was. Sometime on or before April 18, an unknown individual discharged an undetermined substance—believed by the city of Atascadero to be a “pond dye” product—into the waters of Atascadero Lake, violating city ordinances and possibly the environmental laws that govern public lakes. WHODUNIT? : A substance believed to be “pond dye” was discharged into Atascadero Lake on April 18, turning the lake bright blue. The color has diminished since, but the California Department of Fish and Wildlife is still investigating who did it and if the solution was toxic. City officials were notified by a maintenance worker of the incident on April 18, and an investigation ensued into who made the discharge and what exactly it was. Atascadero Public Works Director Nick DeBar told New Times that the substance is believed to be a pond dye product based on “some water testing.” Pond dye is a chemical solution put into private ponds to brighten their coloring and to inhibit algal blooms by shielding the sun’s UV rays. DeBar said that the California Department of Fish and Wildlife and the Central Coast Regional Water Quality Control Board are further investigating the matter. He said the city is ultimately liable for any necessary cleanup if a perpetrator isn’t identified. Teri Hickey, a game warden for the California Department of Fish and Wildlife, told New Times the agency is looking into the incident but has not tested the water, and doesn’t know if the substance is harmful. Michael Thomas, an assistant executive officer for the Central Coast Regional Water Quality Control Board, claimed he had no knowledge of the incident or any agency investigation about the matter. 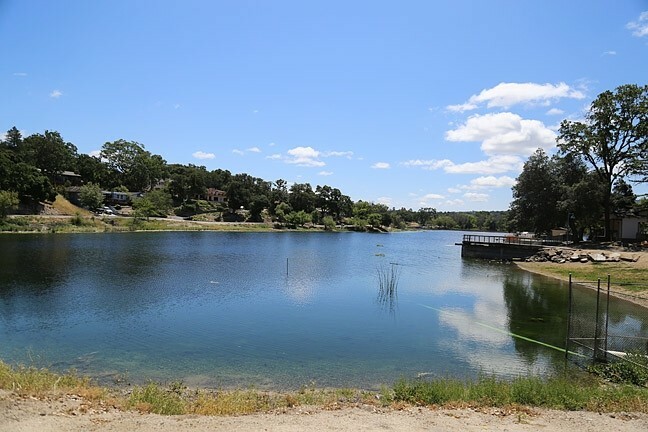 Atascadero Lake has gone through a major transformation over the past few years since the local treasure hit rock bottom in 2013, when the lake nearly went dry and 400 to 500 fish were killed by low water volume and an oxygen-hogging algal bloom. The decline spawned the formation of nonprofit Friends of Atascadero Lake, which has since been working with the city to bring the lake back to life. To celebrate the lake’s revival, Friends of Atascadero Lake is throwing the first annual “Lakefest” event in June. Paul Murphy, president of Friends of Atascadero Lake, said the organization wasn’t involved in the discharge incident. He told New Times that he believes someone decided to bypass the authorities and inject the dye. He said the lake has been dyed in a similar fashion before. Murphy supports taking measures to suppress algae growth, which can be a nuisance and harmful to the lake if left to its devices. Murphy pointed out the difficulty of working around regulatory red tape to make any changes to the lake and its environment.